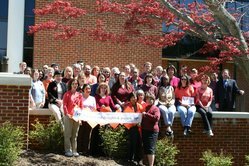 Colleges all across America have come together to show support to the Virginia Tech students after the shootings that occurred there on April 16. Cox Driving Range on Prices Fork expresses its support for Virginia Tech. 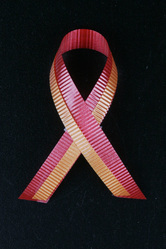 The Old Navy in the Roanoke Mall expresses its support to the Virginia Tech community. 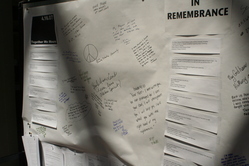 A remembrance board has been set up inside the main entrance to Squires, with excerpts from e-mails across the world and space for people to scrawl their thoughts. 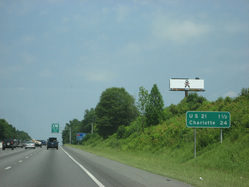 Outside of Charlotte, NC, a billboard stands with the VT ribbon/logo. Hokie maroon and orange dotted the solemn crowd Tuesday night as hundreds from the Carolina community turned out in support of their peers at Virginia Tech. I finished my degree work at Virginia Tech in 1974, and in all these years, I have never regretted my choice to go to Blacksburg. I became the man that I am there. Ardent UNC men&#39;s basketball fans stood aghast at a January defeat at the hands of Virginia Tech, cringing at the sight of any reminder of their Virginian foes. 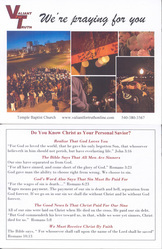 Front and back of postcard distributed by Valiant for Truth (www.valiantfortruthonline.com). Found on April 27, 2007 in Holden Hall bathroom. Draft of resolution passed by the George Mason Student Senate to support the greater Virginia Tech Community.